Bank of America’s stock climbed again on Monday as economists predict higher inflation and economic growth. There's no question Bank of America (NYSE:BAC) has been one of the biggest beneficiaries of the presidential election. Its stock has soared since Donald Trump emerged victorious last week, and its shares are adding to their gains today. 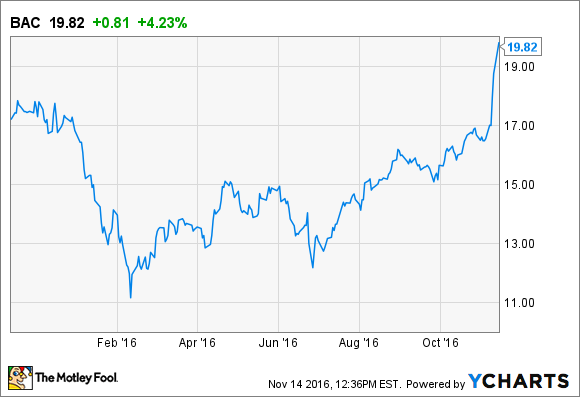 Shares of Bank of America have climbed 17% since the day before the election. Today alone, they're up 5% halfway through the trading session, giving the bank a new high for the year. The move in Bank of America's shares today seems to be in response to news that economists have boosted their estimates for economic growth and inflation. The revisions were based on Trump's campaign promises to reduce regulations, lower taxes, and invest heavily in infrastructure projects. All of these things come straight out of John Maynard Keynes' playbook, written at the time of the Great Depression. Keynes argued that the way to get an ailing economy moving again is to offset any decline in consumer expenditures, which account for a majority of the United States' gross domestic product, with higher government spending. Attempts to do so under the Obama administration were stymied by the Republican control of Congress. But now that both the White House and Congress are in the Republican party's hands, economists have become optimistic that these types of reforms are not only possible, but probable. A piece by Josh Zumbrun in The Wall Street Journal today reported that economists now expect the economy to expand 2.2% in 2017 and 2.3% in 2018, up from 1.5% over the past year. Inflation is also expected to increase, growing to 2.2% next year and 2.4% in 2018. By contrast, the Federal Reserve has struggled to get inflation above its 2% threshold since the financial crisis eight years ago. If these estimates come to fruition, it'd be very good news for bank stocks, and Bank of America in particular. Higher economic growth would spur loan demand -- loans being the principal product sold by banks. And higher inflation would invariably fuel higher interest rates. 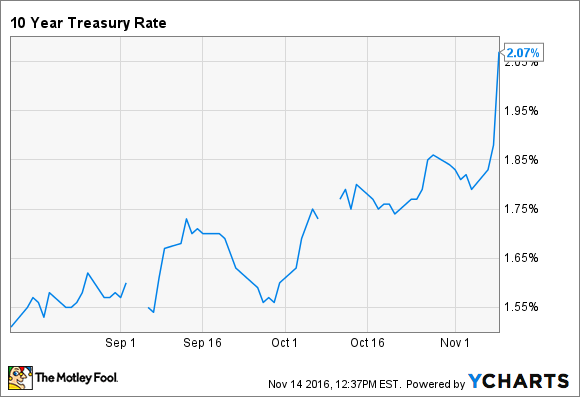 To this end, the yield on 10-year Treasury bonds shot up from around 1.7% at the beginning of October to more than 2% today. In put this in perspective, in Bank of America's latest quarterly filing with the Securities and Exchange Commission, the bank says a 1% increase in long-term rates alone will translate into $2 billion more net interest income. And if both short- and long-term rates climb 100 basis points, then Bank of America's net interest income would rise by $5.3 billion. That's a lot of money given that Bank of America currently earns only about $5 billion a quarter. Thus, while a Trump presidency is not without controversy, there's reason to believe it could very well help Bank of America make a lot more money and, more broadly, usher in a rapid recovery for bank stocks.